Ever since surgery, DOP has had this little tube sticking out of the back of her head. It’s called an Exterior Ventricular Drain, or EVD. It connects to a hanging bag that collects the fluid that builds up over time. The funny thing is how this whole EVD thing works. It’s rather simple, really. It’s all based on simple physics…gravity to be specific. So the nurse hangs with a rope this little collection tube exactly parallel to DOP’s ear canal. When leveled out, this is the Zero Point. If she lowers the collection tube below the ear canal, then gravity kicks in and the fluid drains out of her brain, thereby reducing the pressure in the brain. If the nurse raises the collection tube above the ear canal, then it increases the pressure in the brain because it takes more before it drains into the elevated tube. Raising or lowering be degrees allows the doctors to monitor the pressure and also how much fluid is being produced. This all makes sense…until you see how they level it to the Zero Point. 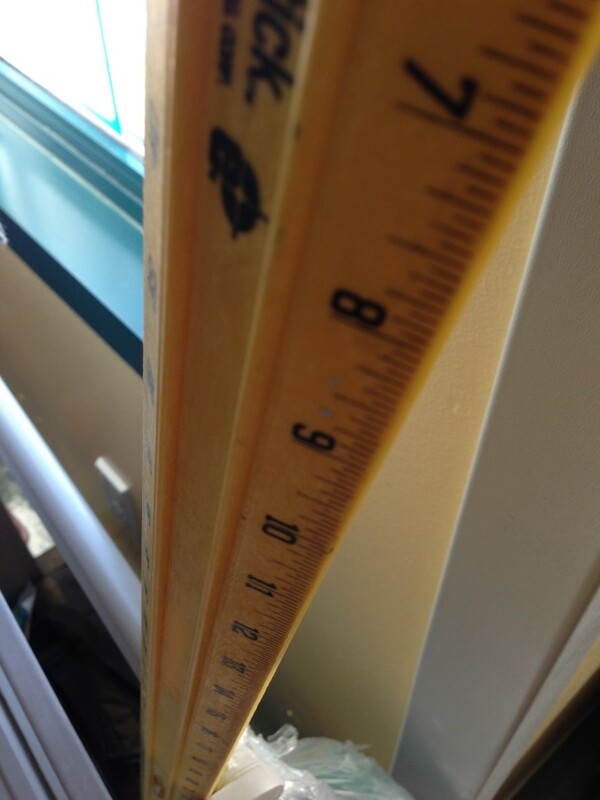 They use a yard stick ruler with a level bubble. All this technology around us…..
We have the ability to reach into someone’s brain and remove a tumor. 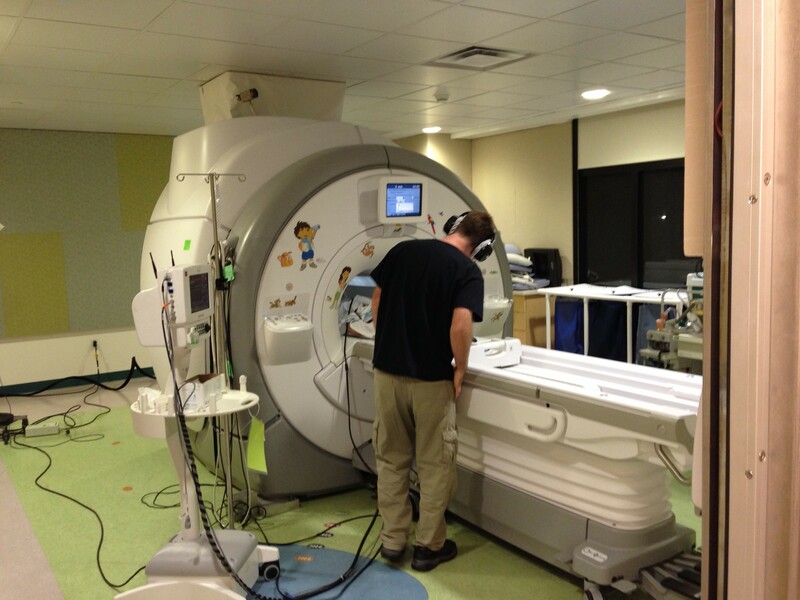 We can scan their head with touchless MRI technology and see microscopic bits of tissue. 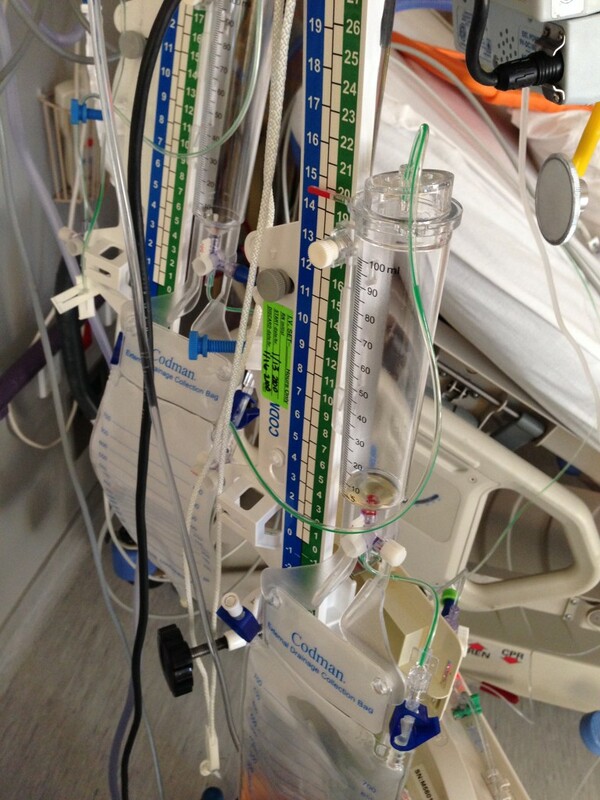 The child down the hall has had heart surgery and has a dozen tubes in her body. The nurses can recall any amount of patient data wirelessly from anywhere in the hospital with these cool little portable computers. But when it comes to leveling a brain drain….we use a level and a rope. 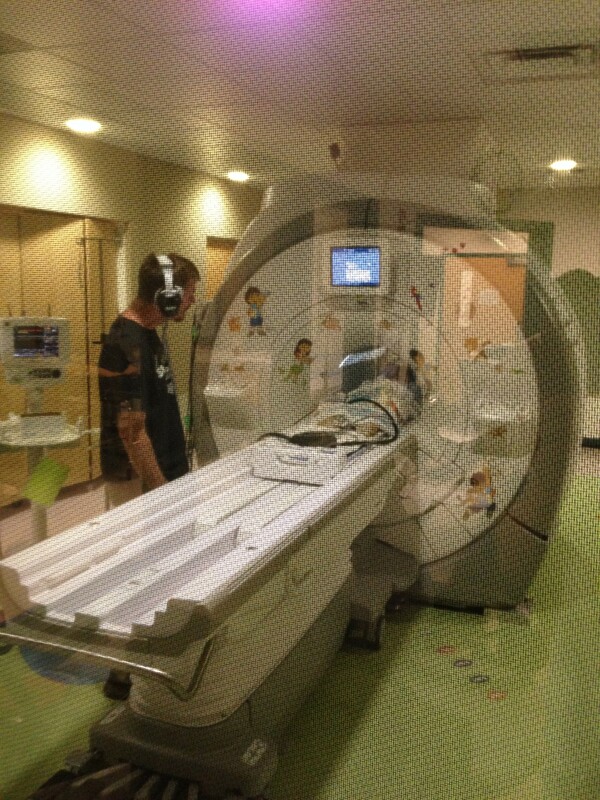 Last night DOP went in for another MRI. This one went fairly quickly and they let me go inside with her again. For all three of her MRI’s she has gone in without sedation. She is such a trooper! I know full grown adults who can’t do that! The reason was so the neurologist can determine how much pressure is building up inside her brain from fluid and to compare this with the EVD readings. As of this morning, they were not happy with the results. They’re not bad, but just want the pressure to be less. So they’re waiting another day before removing the EVD from her head. Please pray that the pressure continues to level out to normal. If it doesn’t go down fast enough, they’ll resort to a permanent shunt that will have to be installed under her skin down her neck into her chest. So please continue to pray for any swelling and brain fluid drainage, etc. Lastly, Brandy and I are increasingly concerned about her speech and fine motor skills. Everything in her personality seems to be in place, except for her lack of talking. If you know DOP at all….she’s never been lacking words! We’re not sure whether it’s hard for her to talk, or hurts, or whether there are some residual effects from the surgery. Her hand and arm movements are still very slow and don’t seem to be improving much. Is this permanent damage? Will her normal movements and speech return after a while? Will she need therapy? These are all still unanswered questions. Please keep praying for these issues as well. Thanks so much for everyone’s support and prayer and help. This entry was posted in Daughter of Purpose, Uncategorized by Nathan Freeland. Bookmark the permalink. Father God…..you know our hearts desires for this sweet child…we know you love her and want the BEST for her…so I pray for exactly that …..YOUR VERY BEST for #DOP. Thank you in advance for your sweet mercy and grace and how all of this will glorify YOU in the end!!!! Give Nate, Brandy and the kids rest, peace and blessed assurance that only comes through you! In Jesus strong a faithful name I pray….AMEN!